How To Germinate Nicotiana Seeds. It seems a few of you wonderful cherubs are having difficulty in germinating your Nicotiana. This is understandable…she is a fickle Mistress. This is how do it…it works for me…other peeps have different methods. I prefer to use a modular tray which sits in a gravel tray. I put a little water in the gravel tray so that the seed compost (gently firmed down) will soak it up. Then I simply sprinkle tiny pinches of the seeds into each module. Nicotiana seeds are super fine…some flower growers mix a little pinch of sand in with the seeds to make it easier to handle. Leave the seeds on top…do NOT cover with compost as they need light to germinate. I place over the top of the tray a piece of damp newspaper…preferably with the image of a rock and roll star on…Nicotiana, like Amy will live fast and die young. Dampen down the paper and leave by a windowsill…you’re looking for temps of 21 degrees and above. Don’t water with cold water…let it get to room temperature. Allow 7-14 days for germination and don’t allow the compost to get dry in this time…but not waterlogged either (I never said this was going to be easy…). 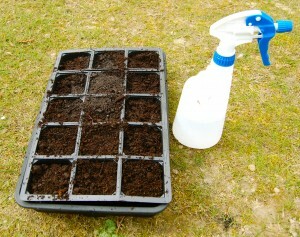 After the 15th May you can sow them directly outside but water the ground first to stop them blowing away. I started these ones yesterday and will keep you posted on their development. Oh yeah…NEVER put your seedlings out until after the frosts have gone…oh no no Mrs. I will show you how we plant out the seedlings when the time comes…stay tuned. 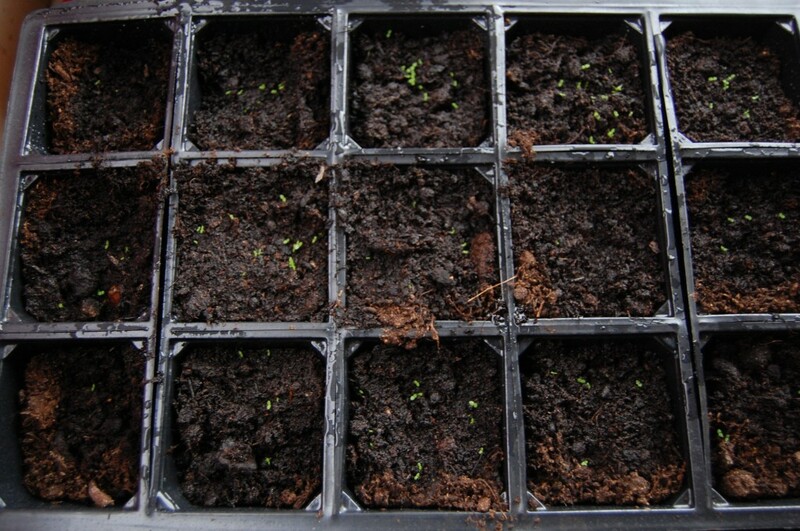 ok…so that was 10 days ago…now the tiny tiny seedlings are showing through…so in each module…I will simple take out the ones I don’t want and leave one in each of the 15 modules. 15 plants will do me this year. Useful article – thanks for posting it. I’d like to have a go at saving and growing some seeds from the plug plants that I bought this year. They’ve done really well and flowered beautifully in the garden. I’m hoping that some seeds will self set, but I’ll collect some to grow in my greenhouse as well. One question: when do you remove the newspaper??? “Room temperature” depends heavily on where you live. You might want to specify. I’m in a ~100-yo house in Colorado Springs, and it tends to be cool (< 65 degrees) at night. When I lived in Texas, it was more like 65-74 all day since air conditioning is pretty expensive. Would have been perfect pepper-sowing 'weather' indoors! :P I wonder if I should use some kind of thermometer and heater to get better germination rates/times on the tobacco seeds… Maybe next time. I'm going to try comparing starting with light, sandy soil, versus starting with Miracle Gro (starter) Potting Mix versus cactus/succulent starter mix. Small seeds like grasses and nicotiana should do well in all 3 but I want to see the differences. Needless to say, I brought in all my starter pots before that big snowfall last week. Heck, the Ace hardware store had plants at $2 (normally $3.68) for ones in 4-inch peat pots because they had to bring them all inside and they were in the way. Got 14 Red Beefsteak and 3 Early Girls that I'm taking in and out every day until May. Good luck everyone, on their nightshades! Tomatoes, potatoes, tobacco, peppers, they're all good! Fab advice in a fun voice……. 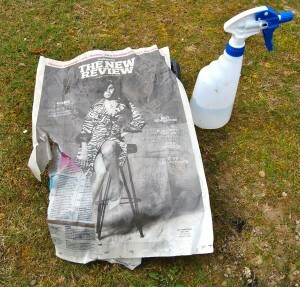 off to find a picture of Cliff Richard…. Dear Ben, just wanted to thank you for the seeds and the nice hand written note. Just thought that I would update you : sunflowers, calendular, bupleurum (?) ammis and cosmos are all up and looking well. I seem to be having a bit of bother with the ricinis but I might have planted them too deeply. I will try again next year. Your website has given me the confidence to have a go. Ricinus can be hit and miss…worth soaking them overnight…and sometimes they seem to take yonks to germinate. Sounds as though the others are doing well…keep us up to date…you can send pics to the twitter account….we will start publishing other folks efforts in a week or so. Thx for posting. Have fun! …let me know if you are ordering again this year and I will send you some Ricinus seeds to try…see if we fair better this season. Hmm, I seem to have the reverse problem to everyone else – thousands of the little blighters have germinated but they are teeny tiny – how on earth am I going to prick them out? Advice pls. PS these weren’t your seeds but saved N. ‘Malibu Lime’ I got from a seed swap. I often get the same problem Jane. My method is very right wing. The above Nicotiana are Sylvestris…big old plants….I don’t need a whole fleet of them…15 will be loads…and enough for me to give a couple to the girl I fancy down the chip shop. So…I merely kill off the ones I don’t want, leaving just one in each module…this way I don’t have to prick them out….just let it grow in the module until it’s big enough to go out into the Higgledy Kingdom. excellent stuff, so nicotiana seed sowning session round two coming up. Going to try the sand thing as found them very fiddly, can also see didnt have them warm enough. Room temperature seems to do the job…I sowed some last week and they popped up in four days…they are super tiny though…bless em. Good luck!